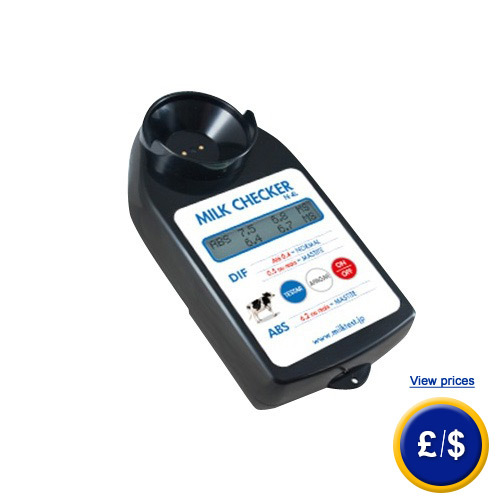 The Milk Checker allows a very precise diagnosis of sub-clinical mastitis even at its initial stage. The milk checker shows within a few seconds very reliable results of its measurements on the numeric display. By using the milk checker to determine the health of your cattle prior to births and during the whole lactation period you can gain a higher yield of quality milk. Thus by using the milk checker you can prohibit a spread and reach of a clinical mastitis, since their might be no clinical symptoms at the initial stage. By that high costs on treating the disease can be avoided. The milk checker features very innovative technologies, so that even slightest changes in the electrical ductility of the milk can be detected by the milk checker. This phenomenon can be described by the following: In case of an inflammation of the mammary gland (mastitis), parts of the blood plasma gets into the milk, which results in a higher concentration of natrium and chlorine in that milk. Thus the conductivity is much higher. That anomaly is them detected by the milk checker. Since a mastitis always starts from one mammary gland, instead of spreading from all mammary glands at the same time, the other three mammary glands are used as references by the milk checker. The milk checker then calculates the difference between the four mammary glands and by that determines the mammary glands, from which the mastitis spreads. Since the sub-clinical mastitis shows no visible symptoms, it is very hard to determine without any auxiliary device. If not diagnosed the sub-clinical mastitis becomes a clinical mastitis. At this stage the disease causes higher costs for its treatment with antibiotics and - in very complicated cases even a quarantine of the infected cattle might lead to even higher costs. The milk checker helps determining the disease even before the cattle gives birth by testing the colostrum and checking on the cattle during the whole lactation period. Furthermore the milk checker allows monitoring the effects of antibiotics on the disease's course. If there are any questions about this milk checker, please have a look at the technical specification below or call: UK customers +44(0) 23 809 870 30 / US customers +1-410-387-7703. Our technicians and engineers will gladly advise you regarding all conductivity meters and all products in the field of measuring instruments, regulation and control and scales. 3. Calculation of difference between the electric conductivity of all mammary glands. For all four udder dugs you can use the same measuring container. There is no need of cleaning the container in-between measurements. The milk should be milked directly into the measuring container. Afterwards press TEST to start the testing process. Then simply pour out the milk and check next udder dug. Protects display from milk splashes. Due to a hard-wearing enclosure the milk checker proves to be 100 % weatherproof. Allows precise measurement disregarding the room temperature. Thus the tests can be performed at any time of the day or year. The electric conductivity of the milk is measured very precisely. Thus even the slightest difference from one udder dug to another can be detected. Allows displaying measuring results of all four udder dugs at once precise to the decimal. Mastitis is an inflammatory infection of the udder dug. It is often caused by bacteria invading the teat canal. After a rapid proliferation of the bacteria, the immune system reacts with an inflammation. The inflammation state depends on type and amount of the infiltrating bacteria and the immune state of the cow. The symptoms show a large range of variety starting from no visible symptoms (sub-clinical mastitis) reaching severe symptoms even leading to death.